The white coat of the Maltese is a common naming platform for owners of the breed. The most popular of the white themed names are Angel, Casper, and Aspen. As reality TV has become increasingly common, reality star dog names are trending among households. Some famous reality stars known to lend their names are Paris, Heidi, and Kate. The Maltese is thought to have originated on the island country of Malta. Many interesting names can be borrowed from the various rulers of Malta over the years. Simon, Roger, and Tancred are names taken from kings of Malta under the Norman rule. Conrad, Frederick, and Manfred are few choices from the Hohenstaufen Dynasty. More recent ideas taken from Governors of Malta include Grant, Borton, and Hastings. Some of our pages will contain a subcategory. A subcategory is a slightly more specific grouping than the main topic of the page. For a subcategory, we will include a separated table of names and corresponding descriptions. An example of a subcategory of Red Dog Names would be 'Dog Names Inspired by Red Wines'. 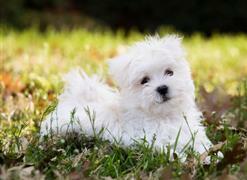 If you have any subcategory ideas for the Maltese Names page, we would love to hear them. Use the form below to submit your ideas.